Before mono canvas became the preferred medium for working needlepoint projects, the double-thread canvas was the only kind available. Commonly called, Penelope canvas, it is the most noticeable and complicated of all needlepoint canvas types. Instead of one strand per mesh that is typical of single thread canvas, there are two strands woven side-by-side for each canvas mesh. This makes the construction so unique that it appears not to be even-weave material at all. Vertical Thread Construction - The vertical (warp) double strands have threads that are woven close to each other to form pairs, with plenty of room to gently pull them apart when making detailed stitches. Horizontal Thread Construction - The horizontal (weft) double strands are woven more widely spaced apart from each other just like single-weave canvas. Surprisingly, when you step back and look at the double-thread canvas as if from a tree-top view, you’ll find that it actually does have an even-weave. If you want to know why Penelope or double-thread canvas is still used and if you should even bother considering it for your needlepoint projects, take a look at these advantages and disadvantages of stitching on this type of canvas. Penelope canvas is perfect for stitching fine details as in the faces depicted in the above image. The vertical thread pairs can be spread apart and worked as single strand intersections to get finely detailed results when blending colors or working eyes, lips, noses, fingers and other tiny motifs. Double-thread canvas gives you the best of both worlds, and you can work exquisite details as well as larger areas—all on the same canvas! When working background areas or larger motifs, all you have to do is treat the thread pairs as single strands. You can purchase Penelope canvas in the same mesh sizes as single-thread; but since it is not commonly found in local needlepoint shops, you will have to order it online. Working a project on Penelope or double-thread canvas can be challenging. At the very least it requires more focus and concentration than when stitching on Mono Canvas. If you like humdrum stitching on painted canvas with only the occasional color change or needlepoint stitch variation, then Penelope canvas is NOT what you should use. Penelope canvas does not have the same amount of sizing as mono canvas. As a result, it is much softer and should be mounted on a frame for stitching—especially when working on tiny details. But care should be taken not to stretch the canvas too tightly, or it could negatively impact the results. Extra care must be taken when working stitches on Penelope canvas, as the fibers, are more delicate than those of single-weave canvas. You’ll find it is harder to pull needlepoint threads through the small openings between the vertical strand pairs than when working with single thread canvas. The only stitch that seems to work successfully with Penelope canvas is the Half-Cross Tent Stitch. You’ll need to stay away from Continental, Basketweave, straight and decorative stitches. It takes at least twice as much time to complete a needlepoint project on Penelope Canvas than on conventional single-thread canvas. Although the disadvantages far outweigh the advantages, you may still want to use double thread needlepoint canvas for certain projects--especially if you design your own. Both quick-point and needlepoint rugs are worked on large mesh canvas that’s #3 to #7 per-inch, the same size as used for latch hook rug projects. 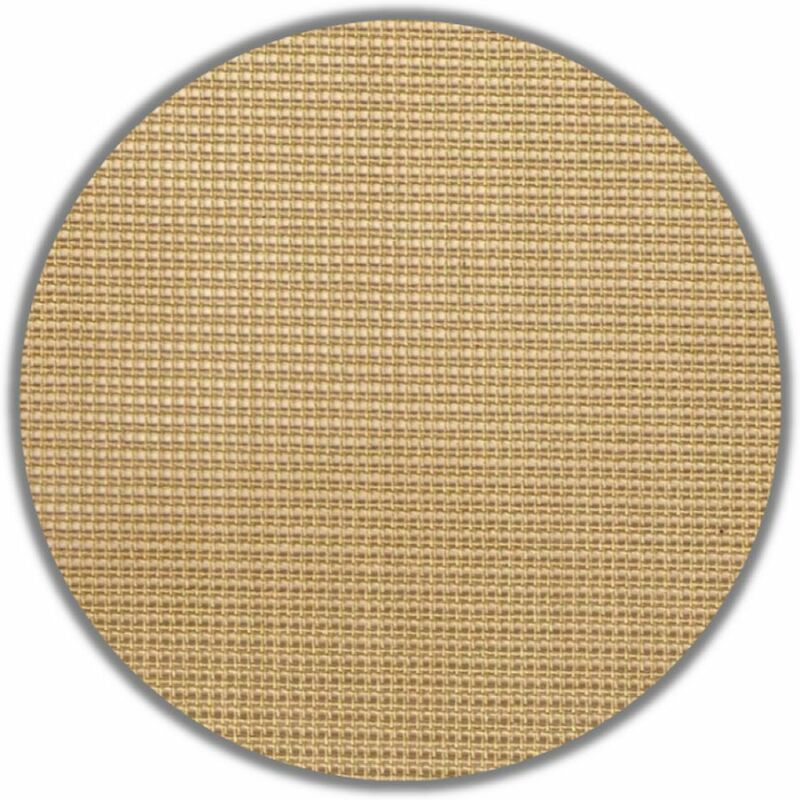 This canvas can either be large mesh single-thread interlock or Penelope double-thread canvas; however, the preferred size is #5 in either type of canvas. An interesting fact about needlepoint projects worked on such a large mesh is that completed designs will be quite eye-catching, vivid (depending on the color scheme) and striking. The large canvas mesh of rug canvas guarantees that any motif you stitch will be large as well; so only work needlepoint designs that are simple and without much detail, like geometric patterns, simple flowers, and basic shapes from coloring books, clip art or other graphic designs. Any diagonal stitch can be used to work a quick-point project or needlepoint rug on large mesh canvas. Why? Because the diagonal slant of each stitch will lock the thread in place, giving you thorough coverage as you work your way across the canvas. Straight vertical or horizontal stitches will not work; the holes between the mesh strands are way too large to support heavy rug yarn. This will cause the thread to lift or bunch up once you have completed stitching, and all your hard work will have been for nothing! Use traditional diagonal tent stitches as well as the full array of cross stitches--any slanted stitch will work; so you're really not as limited as it may seem. The best needlepoint thread to use for Quickpoint or a rug is​ Persian yarn. At a minimum, you will have to thread 6 plies in a size #13 tapestry needle for stitching, and you may need up to 9 plies depending on the size mesh canvas you are using. Before stitching, experiment with a small section of the canvas and the thread you have chosen to accurately gauge how much will be needed. Needlepoint rugs can be worked on any type of canvas in whatever size mesh you choose. Not so for Quickpoint; it can only be worked on large mesh (#5 is recommended). That's why it's called Quickpoint!